ISIS has committed the crime of genocide as well as multiple crimes against humanity and war crimes against the Yazidis, thousands of whom are held captive in the Syrian Arab Republic where they are subjected to almost unimaginable horrors. The present report, which focuses on violations committed in Syria, is based on 45 interviews with survivors, religious leaders, smugglers, activists, lawyers, medical personnel, and journalists. Considerable documentary material was used to corroborate information collected by the Independent International Commission of Inquiry on the Syrian Arab Republic. ISIS has sought to destroy the Yazidis through killings; sexual slavery, enslavement, torture and inhuman and degrading treatment and forcible transfer causing serious bodily and mental harm; the infliction of conditions of life that bring about a slow death; the imposition of measures to prevent Yazidi children from being born, including forced conversion of adults, the separation of Yazidi men and women, and mental trauma; and the transfer of Yazidi children from their own families and placing them with ISIS fighters, thereby cutting them off from beliefs and practices of their own religious community, and erasing their identity as Yazidis. The public statements and conduct of ISIS and its fighters clearly demonstrate that ISIS intended to destroy the Yazidis of Sinjar, composing the majority of the world’s Yazidi population, in whole or in part. In the present report, the Commission has made wide-ranging recommendations to the United Nations, the Governments of Syria and Iraq, and the wider international community concerning the protection of and care for the Yazidi community of Sinjar. While noting States’ obligations under the Genocide Convention, the Commission repeated its call for the Security Council to refer urgently the situation in Syria to the International Criminal Court, or to establish an ad hoc tribunal with relevant geographic and temporal jurisdiction. 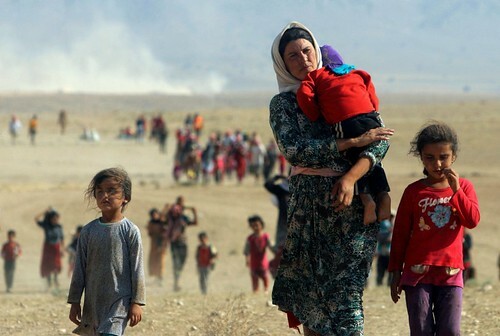 Over 3,200 Yazidi women and children are still held by ISIS. Most are in Syria where Yazidi females continue to be sexually enslaved and Yazidi boys, indoctrinated, trained and used in hostilities. Thousands of Yazidi men and boys are missing. The genocide of the Yazidis is on-going. Poor Christian mother languish in prison over false blasphemy case since 2009. Will you stand for Aasia Bibi? A mother on death row in Pakistan over blasphemy? Dedicate a tweet for a Christian mother on death row in Pakistan? Why is justice a thing of past for minorities, a double jeopardy for all minorities in Pakistan?